These are the opening lines of the petition “Save the oldest and deepest lake in Europe!”, signed so far by more than 14,500. Once it reaches 15,000 signatures, it will be sent to the Prime Minister of Macedonia, the Mayor of Ohrid and the director of the Galichica national park. The petition was initiated by and NGO, Front 21/42, one of he few organizations advocating for a stop to the government’s plan for Ohrid and the nearby national park Galichica. Front 21/42 is demanding the government to abandon the plans for the construction of an expressway and of a large tourist ski complex in the national park, and for the urbanization of a large portion of the lakeshore of Ohrid. The realization of these plans, highlighted by Front 21/42 as “absurd and megalomaniac projects”, would have a negative impact on the biodiversity, the soil, and the waters. The damage, warn the experts, would be irreversible. A vast area of the mountain Galichica, since 1958, is protected by the law as a national park. Also the International Union for the Conservation of Nature (IUCN) recognized the extreme importance of the area. Galichica has been internationally recognized as an important plant and butterfly area. Also, it is home to the critically endangered Balkan lynx (Lynx balcanicus), a subspecies of the Eurasian lynx. Because of its extraordinary biodiversity and international significance, in 2014 the Galichica national park became part of the UNESCO World Network of Biosphere Reserves. The park is a candidate Emerald site , under the European Union’s Natura 2000 network. 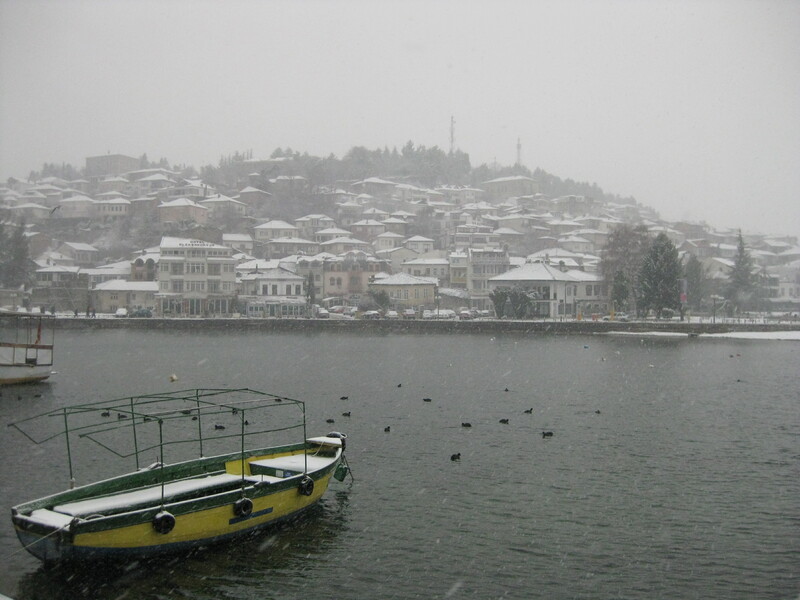 A central part of this important region, both for humans and wildlife, are the Ohrid Lake and the town of Ohrid , equally protected by UNESCO as a world natural and cultural heritage site. The lake was inscribed for its natural values in 1979, and the town for its cultural values a year later. The lake and the surrounding area are marked by a rich history, cultural and archaeological finds. “The convergence of well-conserved natural values with the quality and diversity of its cultural, material and spiritual heritage makes this region truly unique”, underlines UNESCO. Journalists and biologist from all over the world are not chary on words when describing the importance of the lake. For one it is “Europe’s Galapagos ” for another “a Holy Grail for biologists ”. In 2011 and 2013 almost twenty scientists, from all over the world, drilled up to 569 meters below the lake floor into the sediment trying to recover the history of Lake Ohrid. The SCOPSCO project was aimed to study the influence of major geological and environmental events on the biological evolution of aquatic taxa. The international team of researchers uncovered that the combination of longevity and stability has triggered the evolution of the endemic species. UNESCO, in its decision for the protection of the town, highlights that Ohrid, built mainly between the 7th and 19th centuries, is one of the oldest human settlements in Europe. There are archaeological remains dating from the Bronze Age up to the Middle Ages. Ohrid is the place where Saint Clement and Saint Naum, the disciples of Saints Cyril and Methodius, worked, lived and died. “The development of ecclesiastical life along the shores of the lake, along with its own religious architecture, frescoes and icons, testifies to the significance of this region as a religious and cultural centre over the centuries,” continues UNESCO. So far, as it is publicly revealed, the Government’s plan can be divided in two groups of actions. The first one is to further urbanize the coastline by building a marina, tourist resorts and apartments. For this to be completed the Government plans to dry the Studenchishte wetland , a crucial part of the lake’s ecosystem, to cut down the remaining reed-belt and revoke the protection of the last untouched wild area near the St. Naum springs. The second group of action targets the Galichica national park. This includes building a 14 km expressway through the Galichica national park and erasing the protection of a large section of the National Park for building a ski complex which will include hotels and settlements. Of the whole set of plans, the least controversial is the expressway. The need for a quicker and safer road is evident, but on the other hand the designated route through the National Park is problematic. The route should be discussed, as there are alternative solutions, emphasize activists from Ohrid. Opposers to the projects for drying the wetland, revoking the protection of the St. Naum springs and building a ski resort on Galichica, on the other hand, speak of “absurd and megalomaniac plans”. Even UNESCO pointed out that in the present day situation, and without any of this “absurd and megalomaniac” projects being realized, uncoordinated urban development, increasing population, inadequate treatment of wastewater and solid waste, and tourism pressure are already threatening the integrity of this natural and cultural heritage site. Since only two-thirds of the Lake Ohrid, located in Macedonia, as well as a small part of the lake’s basin have been inscribed by UNESCO, the integrity of the property could be strengthened by extending it to the remaining one-third of Lake Ohrid, located in Albania, and including other areas essential to the protection of the lake’s watershed, in order to adequately protect the lake’s exceptional biodiversity. If these projects get realized, and unfortunately all previous experiences in Macedonia are pointing in that direction, then we should say goodbye to the Lake and the National Park as we know them. This assumption is based on the earlier Government’s actions and its style of ruling. The only good information in this chaos is that the ruling elites are too busy dealing with the political crisis and the possible early elections for April this year. But once this is set, the Lake Ohrid and the national park could be on the top of their “urbanizing” agenda. Unfortunately this will ultimately result in jeopardizing the status of world heritage site under UNESCO protection. If the petition and declaration will not bear fruit, the final tool in the hands of the citizens would be to organize a referendum for the proposed plans. As the lake is running out of time, Albrecht and Wilke of the Justus Liebig University in Germany, point out that “the question is not if, but how the lake should be used”. In an open letter they recommend the following immediate actions: a moratorium on all construction activities affecting the lake and its watershed; the implementation of a general management plan, governed by an international panel of scientists and endorsed by the local citizens; and the execution of a strong anti-corruption policy involving planners, developers, scientists and other stakeholders.